We’ve been having fun with my sister and her three kids, over from the USA where they live. Joni is loving having three bigger cousins to entertain him. They never tire of playing “peek-a-boo” like his boring parents do. 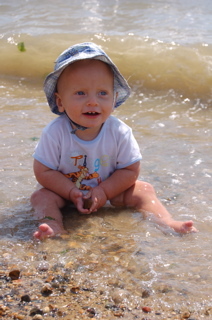 We all went to Southend for the day where he had his first taste (literally) of sand and sea. 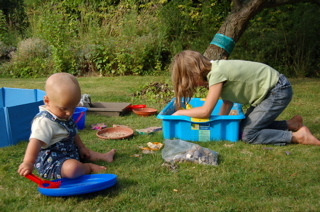 Then the next day we recreated Southend in the garden, with the paddling pool, the sandpit, and some genuine Southend stones and shells. They added the sand to the water, and the water to the sand, and turned the garden into a giant mud pie… which I guess is a fairly accurate representation of Southend. I bought a cool 6 man tent from ebay for fifty quid, it’s tall enough to stand up in, and it’ll only take ten minutes to put it up now we know how it goes. The kids spend the day playing hotels in it in the garden, and the more enthuseastic campers among us (read Hazel and the kids) have been sleeping out in it the last few nights. 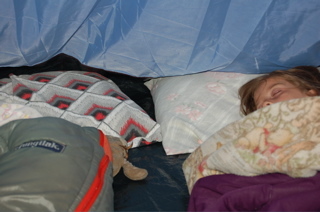 I love it when kids are un-sophisticated enough to enjoy making mud pies and sleeping outside, long may it last. Keswick. Good week. Weather typically Keswick. Stayed in the most amazing flat, looked like it had been completely refurbished just before we arrived, all new and shiny; I don’t even know how to operate a microwave, let alone a dishwasher as well. Thank you Keswick ministries for your “missionary hospitality fund”. 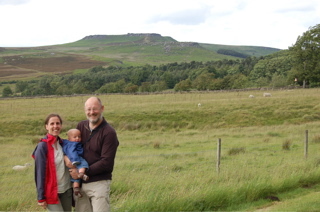 Interesting teaching threads on Genesis, Isaiah, and working with marginalised people. Need to go back and re-read my notes next. Greatly appreciated the well stocked creche, complete with live link-up to the teaching; shame it wasn’t open for more of the sessions, difficult to see why it couldn’t have been. Made the most of the opportunities for walking; pottered around Dodd on an unusually sunny afternoon and spotted ospreys and buzzards, enjoyed some airy views from Catbells ridge on the other sunny afternoon, trudged around Derwent water in the rain, bit of a plod but hey I’ve done it now, and the last afternoon was Skiddaw or bust. Excessive wind and rain meant that no-one else wanted to come, so I took Joni, he doesn’t object (yet), he even seemed to enjoy spotting the sheep when they emerged from the low cloud which was pretty much all we saw above the 500 metre mark. Sometimes I need to do these things to prove to myself that I’m still the person I thought I was. We shared the week with some fantastic people, longstanding friends of Martin who I didn’t really know that well before; I’m risking embarrassing you guys, but I don’t think you realise quite how much I have appreciated having this time with you. Little gifts from God found in unexpected places. This week I just bought my first thing on ebay, and set up a pay-pal account. Does that mean I’m in the 21st century now, or do I have to set up a facebook account… oh please don’t make me have to join facebook. Yesterday we went to see some wonderful people near Dartford. We even volunteered to drive round the M25 and queue for the Dartford crossing on a weekday because we really wanted to see them. Some people really inspire us, not flashy types, just quietly getting on with walking the talk in the place where God has put them. And they have Battenberg cake. Tomorrow we’re off to Keswick convention for a week. 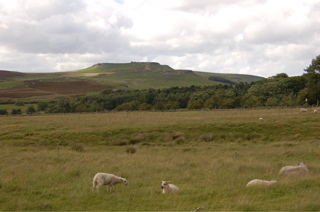 I’m hoping for good teaching and some nice weather to climb hills. I’d like to climb Skiddaw with Joni on my back, and see the ospreys at Dodds Wood. I’m working on writing something about the whole Gafcon / homosexual debate thing. It’s disturbing me and I probably need to write about it in order to think about it. Question; What do Tony Blair, US tourists, and mission leaders have in common?Answer; “It’s Tuesday, must be Holland”. It’s been a bit like that the last week or so. Last Sunday we were in South Darenth, followed by Welwyn. Monday we were in London. Tuesday we were at a school in Baldock, and then Potters Bar. Wednesday we were at a school in Letchworth, and then Cambridge. Thursday we were in Bristol. Friday we were in Oxford. Saturday we were in Lewes. Sunday we were taking part in the service in Baldock, and then the service in Bygrave, followed by going to Reading. On Saturday, someone whose job-title means that he jolly well ought to know better, asked us “How is your holiday going?” Naturally we forgave him…. right after I’d dumped my pasta and sauce over his head… not really, just thought about it… Jesus says that amounts to the same thing. Friends who we were at college with tend to have one or two big churches who provide most or all of their support, so homeleave basically involves popping in to say thank you very much, couple of weeks, job done. While part of me is envious of not spending however many hours on the M25, I also very much value the relationships that we have with our supporters. We put effort into them, we find them rich and meaningful, and we like to hope that we have a role in peoples’ lives as they have in ours. Meanwhile, I’m also glad that this week has some blank spaces in it. That place-to-place thing is good for a few days, but it wouldn’t be my long-term choice for a life-style. Which I guess is one of many reasons why I hope never to be Tony Blair, or a US tourist, or in mission leadership. Rather a long way from being comforted and joyful, I sincerely hope that my continued employment never becomes conditional upon my signing this document or any other like it. Nor do I give permission for anyone else to sign it on my behalf. Dole office next week? We’re back! If you’ve been looking for us, you will have noticed we have been off air for a few days. Our friend who kindly hosts our stuff had some major hardware issues, and fixing a box on a rack in London from where he is in Japan sounds like it was no mean feat.